I’m new to PERL and trying to understand recursive subroutines. Can someone please explain with an example (other than the factorial ;) ) step by step, how it works? Thanks in Advance. Below, are some very simplified code examples in Perl, Ruby, and Bash. blopez@blopez-K56CM ~/hello_scripts $ perl hello.pl "How's it going!" $ ruby hello.rb "Doing great!" Note: In Ruby’s case, stopping the script with CTRL-C returns a bit more debugging information. blopez@blopez-K56CM ~/hello_scripts $ bash hello.sh "..nice talking to you." 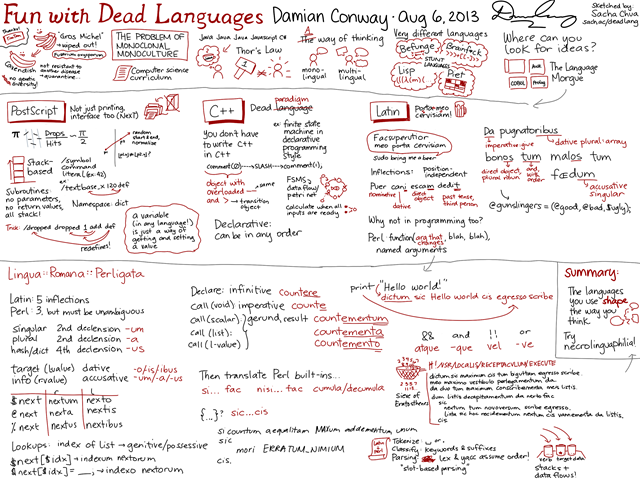 Last night I attended a talk given by Dr. Damian Conway (of Perl Best Practices fame) titled “Fun With Dead Languages“. Although this is a talk that Damian had given previously, it is the first time that I heard it, and I’m so glad I did! I was the first to arrive at the Mozilla office building at 366 Adelaide, and so was able to score a sweet parking spot right across the street (no small feat in downtown Toronto). I arrived and introduced myself to Damian as he was preparing for his delivery shortly before a herd of approximately 70 hackers (according to Mozilla) from all language and computing backgrounds started pouring through the meeting room doors to be seated. Damian has a very energetic style of presentation, and was able to hold our attention while covering everything from the virtual extinction of the Gros Michel Banana, to the benefits and efficiencies of stack-based programming (using PostScript as an example). He compares many, very different languages including Befunge, Brainfuck, Lisp, and Piet, and suggests that a great place to look for new ideas is what he calls the “Language Morgue”, where he includes languages such as Awk, Prolog, Cobol… and even C++ as examples of dead languages and language paradigms. Mr. Conway also dived into excruciating detail on how the Latin natural language can be used as an effective computer programming language, and has even gone so far as to write a module called Lingua::Romana::Perligata, which he has made available on the CPAN. I also had the special treat of sitting right behind Sacha Chua who brilliantly sketched notes of the entire talk in real-time. I haven’t had the pleasure of formally meeting Sacha just yet (didn’t even say “hello”, my bad!) as I didn’t want to distract her. Aside from having my mind blown by Damian’s talk, I was also being mesmerized by Sacha’s artistic skills, and so I do feel somewhat justified in keeping my mouth shut just to absorb everything that was going on right in front of me (front-row seats FTW!). Sacha has made her “Fun With Dead Languages” sketch notes publicly available on her blog for everyone to review and enjoy, and has placed it under a Creative Commons license, so please share freely (and drop her a note to say “thanks!”). Sometimes writing small snippets of code can be meditative. The other day, I realized that, even though I happen to be, among other things, Just Another Perl Hacker, I never bothered to write my own JAPH signature. So I went ahead and wrote up a very simple (but effective) one. Once it was complete, it dawned on me that other perl hackers may appreciate the ability to generate a signature like my own. Since perl is all about code reuse and sharing, I figured I would write up a JAPH signature generator so that anyone can have an awesomely obfuscated JAPH signature like I do. This is all just for fun of course, but if you do end up using my JAPH signature generator, please let me know by sending me a quick message on Twitter to @jbobbylopez. I’ve been toying around with functional programming, and recently came across a perlmonks thread discussing multiple ways to calculate prime numbers. One of the things I noticed about many of the examples was that almost all of them used loops of some sort (for, when, etc). So I decided to tackle the problem without using any loops. Instead, I’ll just use recursive functions. When running this code with larger numbers, I would eventually run into “deep recursion” warnings, which is why I’ve had to use no warnings "recursion"; and set $DB::deep to a specific value higher than 100 (which is the default). $DB::deep is a debugging variable used specifically to limit recursion depth, in order to prevent long-running or infinite recursive operations. The method I’m using here to calculate prime numbers isn’t the most efficient, since I’m not doing anything to reduce the amount of numbers I have to test at each cycle. However, adding some extra intelligence to this, such as the filtering used by the Sieve of Eratosthenes (an “ancient Greek algorithm for finding all prime numbers up to a specified integer.”) should be doable. I’ll be keeping an eye out for other solutions, since I’m sure there are many (especially in perl), but so far this one seems to be fairly fast and clean. I’m looking forward to what Math::BigInt can offer here as well, if anything. I’m currently making may way through a book called “Seven Languages in Seven Weeks” by Bruce A. Tate. So far it’s been an interesting read, but I’m far from finished. One of the things in the book that caught my eye was a recursive factorial function in Haskell, which seemed so simple, that I had to see what it would look like in perl. So I wrote up the following perl snippets to calculate factorials. There are, of course, multiple ways to do it as I’ll describe below. There are also (likely) many other ways which I haven’t thought of, so if you have an interesting solution, please share. One of the things that really caught my attention was how simplistic the syntax was for writing somthing so complex. Recursion is a fairly simple idea once you’ve seen it in action – a function that executes itself. However, the implementation of recursion in a given programming language can be somewhat difficult to comprehend, especially for new programmers or those without programming experience. Although I haven’t dived into Haskell quite yet, it seems to make implementing a factorial function so simple, that I kind of stumbled when trying to understand it, thinking I was missing something.. but it was all there in front of me! So the factorial of 5 is 120. Or 5! = 120. Lets look at the Haskell example from the book. Loading package ffi-1.0 ... linking ... done. After seeing how easy it was to implement the recursive factorial function in Haskell, here are my attempts in perl. This first example doesn’t implement a function, and is really just bad (but still working) code. It requires that your base number be global and alterable, in this case $nni. This second method works similarly to the Haskell implementation. It implements a function that calls itself, without any looping required. Aha, now we’re getting somewhere. In this third example, the fact() function is anonymous, and we’re assigning it to $fact via reference. This allows us to use $fact like an object with a single method that does the factorial calculation. This last example uses perl’s pre-defined variable @_ which automatically holds a list of function arguments by default. I usually avoid doing this, since it hurts readability, especially for those who don’t live and breathe perl on a daily basis. To my surprise, it would seem that Haskell has Perl beat (at least in this example) as far as readability + conciseness is concerned. I haven’t spent much time playing golf here to reduce the number of lines or characters beyond the last example, but if anyone does come up with a tighter solution, please let me know! This version is likely much faster, since the Math::BigInt package is intended to be used in situations where large integers are being handled. I use Freemind quite a bit for brainstorming and as an outliner. One of it’s better uses for me is to hammer out an idea for a perl hash tree very quickly. The problem is that once I have the hash tree exactly the way I want it in Freemind, I have to manually re-create the hash tree in perl source, with all the required formatting. This is no longer the case, as I’ve written a quick and dirty “freemind2perl” script (below) which takes a Freemind mind-map file, and converts it into a perl hash tree automagically. I’m not sure if it will work with all versions of Freemind, but mind-map files (.mm files) are XML based, and the format really hasn’t changed across versions. Just save the script below as ‘freemind2perl.pl’ and run it with ‘perl freemind2perl.pl yourmap.mm’. It requires the “XML::Simple” perl module to be installed. There are many many tools out there which allow you to monitor and view your system or networking logs in several different ways. Sometimes though, you may find yourself looking for a specific feature that none of these tools currently provide. Whenever your goals are very specific, and you don’t want to use a big feature-full program to accomplish a simple task, you may want to consider writing your own tool. Below is a simple Perl program I wrote which does just that. All the requirements of the program are within the script itself (using the __DATA__ handle at the bottom of the file). The only thing you may need to install on your system to get this to work is the File::Tail CPAN package. This program will monitor the end of the file (like the Unix ‘tail’ command) and check for new log entries. When it detects new lines in the log, it will filter those lines with the patterns defined at the end of the script (under __DATA__) and display anything it detects in the logs except those filter lines. You’ll probably notice that the filter lines are regular expressions, which makes this script more powerful than doing filtering by simple full-string comparison. Aside from simply printing the output to STDOUT, you could use regular expressions to pop pieces of each line into an array or hash, in order to do calculations, such as how many entries had a source IP of X, or destination port of Y, etc. Its definitely a good thing to keep in mind that whatever software you could possibly need is already out there on the internet, and possibly open source. However, its also good to keep in mind that YOU can create a tool yourself to accomplish your specific task; all it takes is a little self-confidence, effort, and patience. I’ve been thinking about creating an application using the WxWidgets GUI API. I’ve read a lot about it, and many seem to really enjoy the results of the applications they’ve created with it. For my own purposes, I’ve been looking for the ideal GUI API that would allow me to quickly create cross-platform desktop applications for Windows and Linux platforms (Mac would be a bonus). I’ve looked at QT, GTK, and MingGW.. but I’ve been turned off because they don’t seem to have strong Perl and/or Python bindings (although Perl strong with Tk, I’ve heard). I’ve tried a small test Python program with WxWidgets (GTK version), and was pleasantly surprised at the simplicity of the code. I think I’m going try some other tests, this time using Perl, as I want to note the differences in complexity between Perl and Python code. Currently, Perl is my canvas of choice ((Being that I see programming as an art, more than anything else)).